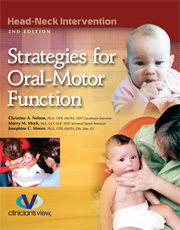 This book offers detailed handling intervention and treatment concepts including oral-motor techniques, head-neck alignment, structural concerns, soft tissue considerations, and facilitation of dissociated movement of the head, neck, jaw and tongue. Neuroanatomical structures are illustrated by Dr, Moore with detailed drawings and functional implications. This text bridges the gap between the physical components of head-neck structure with integration of direct oral-motor treatment.